New York may be considered the fashion capital of the U.S., but if you’re looking to imbibe a more laid-back shopping experience, Los Angeles is unquestionably a mecca of all things California-cool. Whether you’re perusing vintage goods in Echo Park and Silver Lake, browsing the products of up-and-coming designers in downtown L.A., or soaking up the West Coast wares in Santa Monica and Venice, each neighborhood is replete with cool and creative boutiques—if you know where to look. These style hubs prove the innovation, creativity, and good taste that Angelenos are known for. 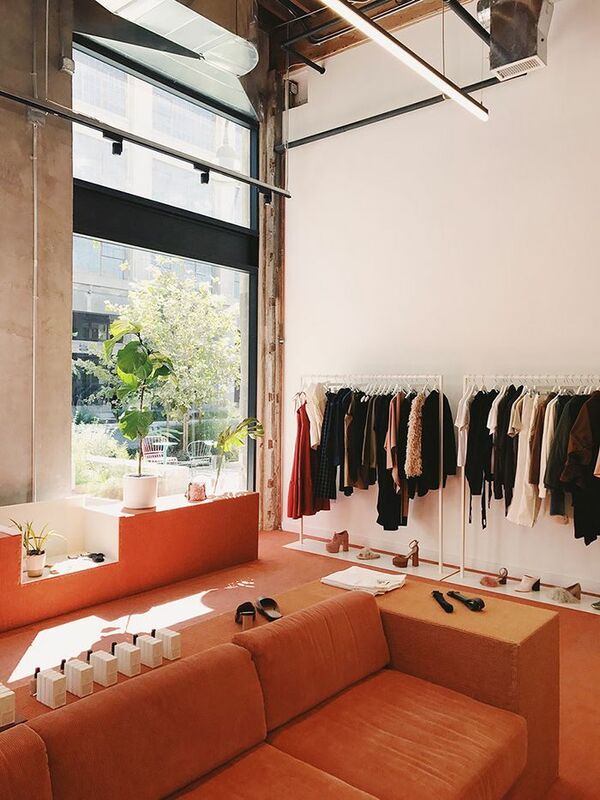 With a flagship store located at Row DTLA and a second boutique on trendy Abbot Kinney Boulevard in Venice, this cool multibrand boutique attracts fashion girls who love to peruse the wide variety of established and emerging designer wares. Can't make it? Shop LCD's website. With locations in Silver Lake and Santa Monica (and coming soon to hipster Highland Park), the beloved multibrand retailer stocks a curated array of local designers alongside international labels such as Jacquemus and Maryam Nassir Zadeh—all displayed thoughtfully alongside trendy home goods and accessories. Can't make it? Shop Mohawk General Store's website. A quick scroll through any L.A.-based fashion insider's feed, and you'll see picture-perfect photos of the most beautiful furniture, décor, and clothing in a wonderful home-like setting. You're getting a glimpse of The Apartment by the Line, a serene lifestyle store on tree-lined Melrose Place which offers refined goods spanning the categories of fashion, home, beauty, and art that come together in distinct rooms. Can't make it? Shop The Apartment by the Line's website. Loved by celebs (Taylor Swift and Emily Ratajkowski are said to be fans) and fashion influencers alike, the beautiful vintage-inspired dresses at Venice-based boutique Christy Dawn exude an easy and effortless California vibe. Moreover, each piece is made and sewn in Downtown L.A. from deadstock fabric left over from large fashion houses, so the whole line is local and sustainable. The boutique also sells bridal wear and knits. Can't make it? Shop Christy Dawn's website. A one-stop shop for the hippest Angelenos, Shop Super Street merges art, culture, and travel. It's where cool girls shop everything from beloved skate and streetwear brands like Stüssy to cult-favorite fashion designers such as Rixo and Ciao Lucia. Can't make it? Shop Shop Super Street's website. After nibbling on a yummy croque madame at Cafe Midi, fashion girls peruse the eclectic mix of global goods inside the iconic concept store American Rag Cie—from the best art books to the coolest jean brands, designer candles, and French bistro chairs. Can't make it? Shop American Rag's website. Fred Segal is the most iconic and recognizable name on the L.A. fashion scene. The mini department store, originally founded in West Hollywood and now located on buzzy Sunset and La Cienega, is home to some of the coolest cult designers in fashion, from Cult Gaia to Staud and Simon Miller. The spacious boutique draws a crowd of fashion and beauty influencers and hosts some of the coolest events and designer trunk shows. Can't make it? Shop Fred Segal's website. Hidden down a walkway off Melrose Place lies a small and charming haven where fashion girls get their beauty fix. Violet Grey sells a highly curated selection of luxury beauty products—from brands such as Vintner's Daughter, Dr. Barbara Sturm, Byredo, and Oribe. It also houses a chic little studio where you can book an appointment to have your makeup done by L.A.'s top makeup artists. Can't make it? Shop Violet Grey's website. In-the-know fashion girls looking for vintage threads and a designer deal head straight to consignment store Wasteland. With locations in Hollywood, Santa Monica, and Studio City, the sprawling stores sell everything from lightly worn designer denim to discounted leather jackets, and there's some real vintage in the mix as well. You never know what sartorial gems you'll score. Up next, New York girls all love to shop here.